Cymbalic Brass. 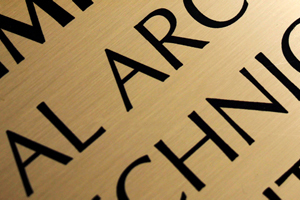 For many applications, our affordable cymbalic brass signs are best. Printed photographically using patented sublimation inks from Sawgrass Technologies, these signs feature extemely high resolution. The brass has a satin finish (with warm and ever-so-slight pinkish cast). The matte finish tends to disguise finger prints and other slight defects. 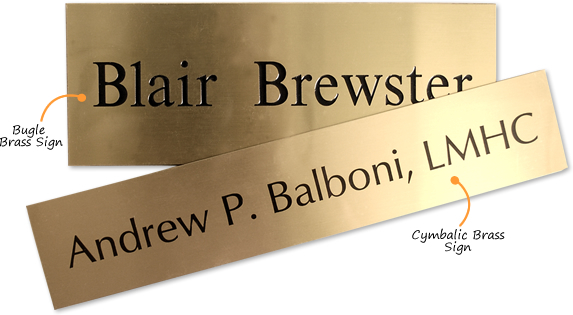 Although Cymbalic brass signs are usually printed in black, color print (and color accents) are possible. Bugle Brass. This is the classic. Bugle brass signs are heavy weight and look great mounted on any door or wall. These signs are first engraved with rotary bits. Then, each letter is hand-filled with a glossy and permanent black enamel ink. Given the thickness of our Bugle brass, the pricing will vary over a year – depending upon the commodity brass pricing. The metal itself is a major cost factor. To help with smudge resistance and weathering a UV coat can be applied - although, this is not common. 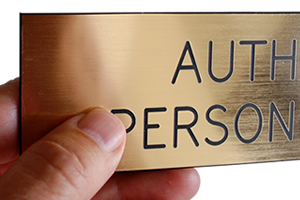 The UV coat is not recommended for brass signs as it tends to reduce the inherent glossiness, which is so much of a brass sign's appeal. Cymbalic brass signs show your legend in high resolution. A logo can be printed faithfully. 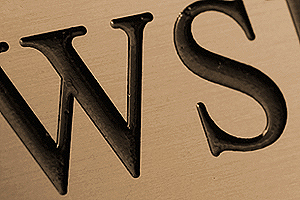 Bugle brass signs feature gorgeous enamel filled letters. Bugle brass signs (right) are twice as heavy as Cymbalic signs. On a strict budget? 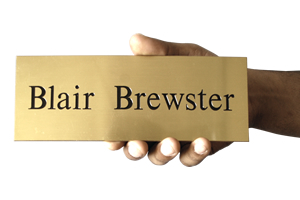 Faux brass, plastic engraved signs have a brass-look. Cymbalic Bugle Plastic Sign (with brass look). *For a similar sized large sign.